A visit to hacienda Yaxcopoil is walking straight into the past. 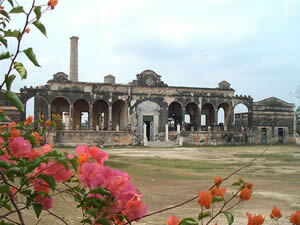 Among some 170 Yucatan haciendas it is one of the few that has been maintained in its original condition, meaning it has not been remodelled into a luxury hotel or restaurant, like Santa Rosa de Lima, San Jose Cholul or hacienda Teya. The decay has been arrested so it is not in ruins like many others. On the contrary, you'll find the estate well preserved and it will come as no surpise to you that Yaxcopoil has been used several times as a movie decor. Easily accessible from Merida, Yaxcopoil is located only a few kilometers south of the town of Uman on the route to Uxmal. Just look for the chimney sticking out over the countryside. That's the easiest way to spot a Yucatan hacienda! If you plan on taking the Puuc Route (which includes the archaeological sites of Uxmal, Kabah, Sayil and Labna), do not miss out on this beautiful hacienda. You won't regret it and the access fee compares to the price of a cup of coffee. Combined it thus means "the place of the green alamo trees". Alamos are abundant on the estate. You can recognise the tree from the long roots hanging from its branches. In times of slavery they were used as whips to punish disobedient workers! The first mention of Yaxcopoil dates back to 1703, meaning the estate probably goes further back to the 17th century, maybe even the 16th. Back in those days haciendas mainly operated to raise cattle and horses. 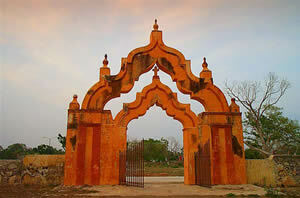 By 1853 it was already one of the largest and most important rural estates on the Yucatan Peninsula. You will see the main entrance is an impressive moorish-style double arch, symbolizing the 2,000 heads of cattle on the ranch. Then, due to the booming business of henequen cultivation in the late 19th century cattle was replaced by agave plants for the production of rope. You can walk the heigh-ceiling lounges and drawing rooms in the casa principal where the owners lived (when they were not in Merida of course). The original furniture imported from Europe remains intact, among which a wooden rocking chair that belonged to the living-in pastor. This is also your chance to have a peek at an original bathroom from your great-great-grandfather's time! In 1864 Yaxcopoil was bought by Don Donaciano Garcia Rejon and his wife Doña Monica Galera. Their rigid glare seems to follow you from their portaits when you walk the main halls. The property is still owned by their descendants. As a sidebar, 1864 was also the year Maximillian of Habsburg became Mexico's emperor during a brief - and eventually frustrated - intent to restore the old monarchy. All the china and silverware you'll see in the dining room were wedding gifts from the empress Charlotte to doña Monica. My favorite piece is a silver flower on the table. The leaves of the flower when turned over actually transform into ashtrays. How's that for being practical! The kitchen is abolutely cute, with all the pots and pans still over the stove. To cool off on hot days (which are many in the Yucatan) the family had their private swimming pool in the back part of the casa principal. There's no water in it, but the dressing rooms remain intact. The workers had their own separate pools for men and women. 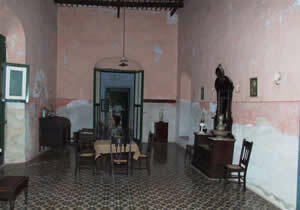 Each hacienda had its patron saint. At Yaxcopoil the saint was San Geronimo, who's oil painting hangs in the chapel. He is still venerated in the village that used to belong to the estate. The same as on many Yucatan haciendas happens on this plantation: the grounds are literally scattered with pre-columbian remains. A good number of unexplored pyramids of variable height from six to twenty meters were found. Pieces of ancient pottery and other relics are displayed in the Maya Room, which serves as a 'museum within a museum'. 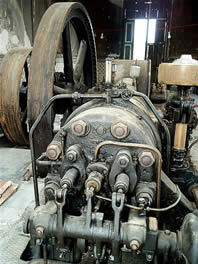 Take the trouble of visiting the casa de maquina where the shredding machines rendered fibers from the henequen plant. After drying in the sun, the heavy fiber packages were charged onto carts pulled by mules and taken to a nearby station, and from there to the harbor of Sisal. If, by then, you are looking for your spouse, he'll probably be in the engine room salivating over a German-made 100 HP diesel motor from 1913 which was actually used until 1984! By then the henequen production at the hacienda ended, after more than a century in operation and many centuries of building history.